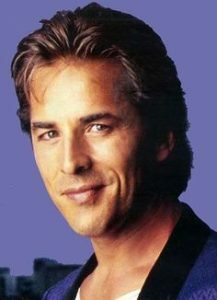 Actor Don Johnson is best known for his role as James ‘Sonny’ Crockett on the hit television series Miami Vice, for which he earned him a Golden Globe. He is also known for his starring role as Inspector/Captain Nash Bridges on the series Nash Bridges. He was born Donnie Wayne Johnson in Flat Creek, Missouri on December 15, 1949, to Nell and Wayne Johnson. He was educated at Wichita South High School and University of Kansas. *His father was a farmer while his mother was a beautician. *His ancestry includes English, with some Scots-Irish, Scottish, German, remote Dutch and French Huguenot. *He is a cigar aficionado. *Finnish music group Don Johnson Big Band is named after him. *He owns a small island on the south coast of Vietnam.